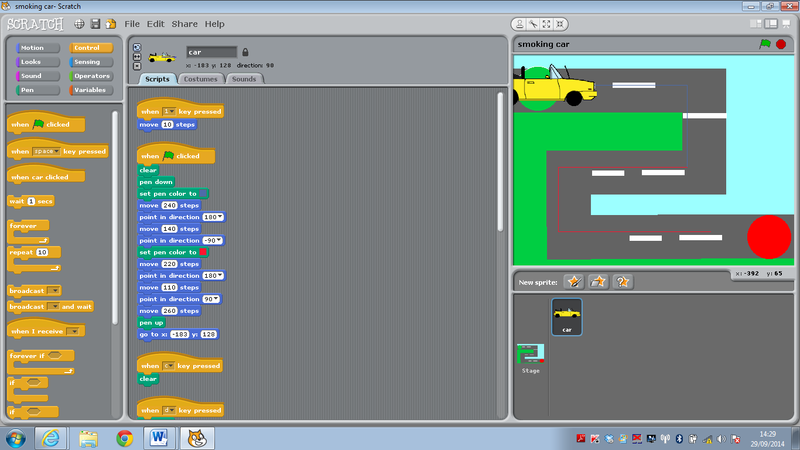 I was very lucky to attend a full day course looking at Scratch programming with Phil Bagge today (29 September 2014). Slides from Phil’s session are available at http://code-it.co.uk/smc.pdf and all his planning resources are available on his website. We started by understanding what computational thinking was and some useful definitions of the trickier terms in the new curriculum. Algorithms and abstraction (I loved the example that abstraction is precisely demonstrated by the London tube map), generalisation, decomposition and logical reasoning. Interestingly, our staff had missed out logical reasoning when dividing up the curriculum as they did not understand it all. We discussed this and they saw that actually this was about questioning the children, getting them to predict and evaluate what they do. Once we started talking about it, they realised that actually this was something they, as teachers, would do naturally through their questioning. This is exactly the definition that Phil gave us! It is a skill that needs to be a taught so that children can do it alone as they progress through the school. A great article on computational thinking By David Barr, John Harrison, and Leslie Conery. Some lovely posters to display in the ICT suite to illustrate those tricky computing terms. One of the best things that Phil did was point out the common mistakes and misconceptions children have when he has taught these lessons. To me this was massively valuable, if you know what sorts of mistakes children are likely to make, it helps you deal with them when or before they arise. It also draws your attention to key teaching points. He was also fantastic at modelling exactly how to do things with the children, including silly voices, physical demonstrations and explaining why some of his modelling was so important. Proper meta-teaching! For KS1 Phil recommends using the Scratch Junior app on iPads. It is free and does sequencing and repeat really well with very little written language and is highly visual. For younger children, start with scratch 1.4 (drawing is easier for the younger children), then can graduate to scratch 2.0. Lego WeDo is a nice way to integrate physical control with scratch. The Scratch projects we worked through from his computer science planning ideas. Always get into the habit of renaming the sprites – so car, not sprite1. Always model moving the blocks carefully to get them to snap together securely, making a big show of the white snap together line that appears under the blocks. It will pay off later when programmes are more complex and make children think more carefully. When selecting a key – make the class read it aloud together, so that chn understand the action. Point out very carefully that the ‘1’ key is on their keyboard! Make a big point of showing the snap together line. Encourage the children to think what they putting together. Always get children to test what they have done. Use extension tasks for those children who want to experiment and challenge themselves. Steering – use point blocks because they are always up, down, right left (see the drop down arrow to get degrees for angles for left, right etc). Use zoom feature on your data projector to show the elements to the children. Stage – allows you to programme the background. Makes sprite code disappear – it is not lost! Use whiteboards for children to think through their actions – planning a route for a child to draw out how the car can get along the road (arrows and write down the directions – worked much better!). Super way to introduce loops and repeats – fits with music really well and children can see the point of introducing loops to repeat sections of their music. Put one repeat inside another and ask children to explain to a partner what they will hear before they test it. Can they predict what will happen? Add the random number chooser in to the select instrument and the sounds will change on each play. Import some loop sounds to show how they can be running underneath any other loops you are using. Programme a button that you have drawn to play notes for a set number of beats, including decimals. Great for demonstrating that two tenths are smaller than five tenths! It sounds shorter – relate to a decimal number line. Take actual music notation and provide a code so that children can convert notes to the numbers, show children that there is a difference between crochet and minims. Music notation is the algorithm that you can convert into a programme by decomposing the notation into pitch and timing and finding repeats. Uses sensing and selection. Make sure children understand the if/=/then/ else. Show some real life examples (if I get a cold then I will start sneezing). Use variable to create the score. Then model how the score changes (how the variable changes) by having a child hold a pot and put pens inside to represent the score. At the end the child says what the final score is by looking in the pot and counting the pens. A nice way to look using variables in a real life situation. Extensions – can you make it count faster? Count in 2s? Count backwards from 1000? Count in tenths? Can you make it count to any number you input? Make a thirty second count down timer to use in the classroom for our tidy up time! Can you make the timer count down from a time chosen by the teacher? 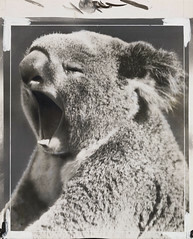 Explain what variables are – moods are variable, the weather is variable (changes). Introduce the idea for what might vary in science (temperature). Teach children that in a multiplication sum a different symbol is needed to replace the ‘x’ (*). Create a menu that children can choose 1 for a triangle, 2 for a square using if/then and loops. Use the forever loop to keep the slug moving permanently. Make it move more slowly by decreasing the number of steps it travels within the loop. Again, it is a great idea to model this physically with the children by reading out the blocks and moving across the floor. A handy hint, to get the slug back off the edge of the screen, right-click on the sprite on the bottom of the screen and use ‘show’. Draw lines using pen down – point out to children that it is more efficient to put the pen down before the loop starts. Ask chn to draw a background with a path for the slug to move along, code the slug so that it if touches the background colour (goes off the path) it makes a horrid noise and says ‘uh oh!’. Overall, it was a super day. lots of information and practical hands on activities packed in. Clear ideas on progression and really clear modelling of exactly how to teach programming to children. I’ve been very inspired by the #nuture1314 posts this week (see a lovely stories collection of tweets and links to other posts), from an idea last year (I think originally from @chocotzar, #nurture1314) the format seems to have taken hold, so here are my 13 reflections for 2013 and 14 aspirations for 2014. I used to really enjoy the formal written reflections we did during my PGCE and reflection is one of the tools I felt I really got to grips with to help my teaching when I was a student. During the hustle and bustle of life at school it is pretty difficult to reflect as deeply as I did then. I find my commute to and from work is a good place to think about specific lessons, or children and plan some next steps, but a chance to sit and think about a whole year of teaching is a rare event and feels very exciting! 1. Passing my NQT year. I’m pretty proud of that, coming into teaching as a novice having been used to being an expert in my previous profession was a steep learning curve, professionally and emotionally. Still feel I’m learning something new everyday! 2. I’m pleased to have put some of my Google teaching experience into action, setting up Google Apps for the school, getting started with class blogging last year, carrying on this year with my new class and trying our hand at two rounds of Quadblogging. I’ve redesigned the new school website started last year on google sites and set up a self hosted installation of WordPress for us to develop our blogging as a school in the future. Major highlights here include having THE @deputymitchell come to start the whole staff on our blogging journey and our most read (over 1000 views) and tweeted post asking my PLN to respond to a survey so we could do some real life data analysis in numeracy. 3. I took my first tentative steps into subject leadership, with my science background being put to use as Science subject lead. I’ve enjoyed starting to make links with other science leads and educators on twitter, and even meeting some in person (the lovely @boydon1967) at a regional ASE meeting. I moved school at Easter so now I am Computing Subject lead which I am really enjoying getting my teeth into. 4. Although it seems an eon ago, I survived my first Ofsted last January. I was brave enough to ask them to come and observe me a second time, having had a very short observation in guided reading, I wanted some feedback on a more standard lesson, and getting a ‘good’ from them for my literacy lesson was worth the nerves. 5. The summer holidays this year were just blissful. Hot sun, time with friends and family, catching up on the life I felt I’d missed out on in my NQT year. 6. Although I tweet far less often than I did before I was teaching, twitter is probably even more an essential part of my day than before. Always informative, supportive and inspiring, I value my PLN every day. if anything my PLN has strengthened further this year, especially after Camped – see below. 7. I finally started going to yoga classes in the Autumn, something I’d promised myself I’d do for years. The classes are well worth the effort of getting out of the house and have really helped me to try to keep work and life in proportion. 8. I’ve a photo of my first class on my study wall. It is so lovely to see them developing in school and know that I have taught them. At my new school I have 29 children in a year 5 class. 10. I couldn’t have made it this far without the support of my family. Especially my daughters and husband who are always there with a smile and a cup of tea. My Mum and Dad have been just as supportive, regularly turning up to garden, wash or iron just when I need it most. No idea what I would do without them. 11. I’ve managed to keep in touch with most of my friends, though many I haven’t seen anywhere as often as I would like. When I have seen or spoken to them, they have been amazing. 12. Thanks to old university connections, I’ve started some consultancy , a small project for some educational materials for schools visiting Rockingham village hall. It has been fun to think of something different and use my teaching knowledge in a different way to offer advice and practical experience to the project. I’m grateful to Zara Hooley for the opportunity. This was a super project. I’ll be working with Zara again this year, but this time to raise some chicks in school, another of her many talents! 13. The last two weeks of the Autumn term are an experience that I would rather not repeat. Difficult circumstances showed me just how strong our staff was and I was thankful to be working with such generous and caring people. 1. Keep up my Yoga classes. An hour and a half once a week to chill out. I did well with this in the winter, which is when I need the exercise the most. Moving to a classroom up 4 flights if stairs has given me plenty of exercise since Easter! 2. Join the Association of Science Education, attend some of their regional committee meetings and continue to network with other science leaders there. After July I will apply to be a Registered Scientist (Rsci) using the fast track system, putting my degree and PhD to use! I joined and had completely forgotten about the Registered Scientist, will try and get this done in the summer! 3. Find out if there is a still a vacancy on our school governing board, and see if I can apply. I moved school and so didn’t pursue this. 4. Continue to develop the use of blogging in class and to encourage more children to post from home or start their own blog. I’ll be running an ICT club this year, and would like to focus it on helping children set up their own blogs. I’m wondering about inviting parents to join us, as I know that many will want to know that their children are working safely online. ICT club was great fun, I have signed up to run one in my new school in the Spring. This may be code club, or an attempt to resurrect some antique lego mindstorm equipment. 5. To make better use of our school iPads in class. I already have a daily task for the children to do in rotation during guided reading, initially it was reading a book for KS1 and recording it on audioboo, making a QR code and putting it in huge book so the children could listen to it. Then we have moved onto allowing them to do some free writing and I’m determined to use this time to develop some other skills over the year. This little and often daily approach has really helped when we’ve used these skills in other lessons. Will be applying this principle with my new class in the new year. 6. Use Coveritlive to develop writing with my class and widen their use of vocabulary. We used it for a hot seating style session before Christmas and I got a glimpse of the power it could have. This will be on the to do list for Spring. 7. Plan and execute our whole school Science day in April. Based on forensic science, I’ll be roping in my husband to add a real genetic scientist in to the mix, with DNA extractions and a taste of university aspirations for our children that school. Science day was great fun, despite the fact that the company we had booked didn’t turn up! Fortunately, my husband was already there so did a little extra and meant that at least KS2 had an outside visitor. 8. Book as many holidays as we can! I’ve learned that the first weekend of each half term needs to be spent away with with family to switch off from the term. we went away at Easter, Half term, last weekend and have 2 weeks booked in the summer as well as another Camped lined up in October! 9. This year my twin daughters will start secondary school. A big step for all of us! Delighted to report that they loved their transition days last week. 10. Get to grips with the new Science curriculum and help other members of staff in school to do the same. Working through the curriculum for both keystages has stood me in good stead for moving year groups. I’m now doing the same with the computing curriculum and have led my first staff meeting. 11. I start teaching the New maths curriculum after Christmas as my year 4 children will be the first to be tested under the new curriculum. Not so much of an aspiration as a reality! 12. Grow more veggies in the garden. 13. Go to #Camped14 and talk to more people than I did at #camped12! If you haven’t heard of Camped, it is like an extended teachmeet/sleepover. Great fun and a great place to meet people that you’ve only ever tweeted with! CampEd was amazing. I’ve blogged about it. 14. Attend and present at a teachmeet. Having organised a national one in my PGCE year, I would like to get back into the local teachmeet community as it is a super place to be! So, here I am. I had a proper break at Christmas and managed to spend a considerable block of time planning and thinking. This has bought me some time in the rush of the first week back and I have resolved to keep ahead of myself. I’ve mapped out when I should do the rest of my planning for the rest of this (very short!) half-term and so my diary popped up this morning and told me what I needed to do. There is little time to stop and think, let alone reflect in the week. I used to enjoy writing weekly reflections on teaching practice and realised how they improved my teaching. So, I’m back here, thinking aloud. Improve my maths planning (and hopefully become more comfortable with it, it is a very painful process at the moment!). A focus on behaviour and raising expectations for quality and quantity of work. 1. Maths – I have been very slow to work with groups of children in a focussed way, this is finally kicking in properly this week and it has made a massive difference to my understanding of what the children need. I can see that I overcomplicate my planning, teaching and activities. For example, on Thursday, I was teaching written addition methods, the middle attaining children used a Google maths map I made to find sums to do (based on Tom Barrett’s collaborative maps). Whilst they loved exploring the map, they struggled with maneuvering effectively to be able to read the questions, and only one pair managed to do more than two sums in the time we had which clearly didn’t make for much time for learning the written method. In contrast, yesterday I was teaching written methods for subtraction and used a simple table of distances of cities from Leicester with a few questions where the children had to subtract on distance from another, then write a question of their own and swap to try someone else’s question. This worked much better, there was more work completed and when marking I could see which children had understood the method (counting on) and which needed more help. It is slowly sinking in that I need to narrow my learning objectives and the narrow the task to fit it (something my mentor has been trying to tell me for some time, but now I’ve finally seen what she means in action it will hopefully click). 2. Behaviour – this has been along hard slog for me and will continue to be for the rest of the year. I am trying to accept this and steel myself to the relentlessness of it. Over the holidays I thought a lot about how I have much higher expectations of my own children than I do of the children in my class. Having twins meant that I quickly had to learn to make rules and stick to them. I realised I had fallen into the trap of thinking that it is too hard to expect the children to do X or Y and I would work up gradually to it. I would fix it later, it would do ‘for now’. I never did that with my own children, they were expected to behave in the way I wanted and there was never any compromise, I did it there and then, I didn’t put it off. Why have I been different with my class? I’m not sure, but something clicked over the holidays and I tried to start the new term as I meant to go on, with high expectations and no excuses. I know it will be difficult to stick to, but I also know that they have improved already and we can only keep getting better. I am responsible for how they behave. In terms of surviving to Easter, I’ve booked the first night of half term away with my family visit Stratford on Avon and take the girls to their first RSC production (The Winter’s tale). We have our oldest friends coming for lunch next Sunday and my parents are coming to watch our daughter in her ballet show the weekend after. My mum is retired teacher and even though she lives 120 miles away, has regularly booked herself in to visit us. She turns up, cleans the house, does all the ironing and puts a week’s worth of delicious home cooked meals in the freezer just at the points when I thought I couldn’t go on. She is amazing. My husband deserves a mention too, he has taken over the large majority of the child care, all the grocery shopping and most of the washing with out a fuss and without complaint. He is beyond amazing. So, I have lovely treats to look forward to, a great support network at home, purposeful days that I can take ‘off’ and spend time with my family, allowing me to work the rest of the time knowing I will get a proper break at least once a week. Finally, I think the time has come for me to admit that I find being a novice incredibly hard. Much harder than I was prepared for. I was very good at my job before, I was used to praise and thanks on a daily basis. Teaching is an incredibly lonely profession and there is something that doesn’t go well or right every day, or many times a day. I am very slowly learning how to be resilient and cope with this, and while my ability to be self-critical is essential to my improvement and development as a teacher, I have a tendency to dwell on my failures too long instead of learning from them, moving on and trying again. Blogging is a way for me to try to record my successes, and exorcise the problems in public so they don’t eat away at me. I’ve been conscious that I have felt I should spend my time working on other things at the weekends and not blogging. This has been an hour spent thinking about my teaching this week. I think it is worth it. Time will tell. I’ve been working without a laptop that connects to the whiteboard all week and today decided to make more use of my iPad instead of the laptop. The whiteboard works only as a dataprojector, and I’m limited to not having sound, as I connect the two using the VGA apple adaptor, but we managed fairly well today. I had saved two presentations I wanted to use in lessons as pictures (a save as feature in MS PowerPoint) and uploaded the photos to my iPad via iTunes and syncing. 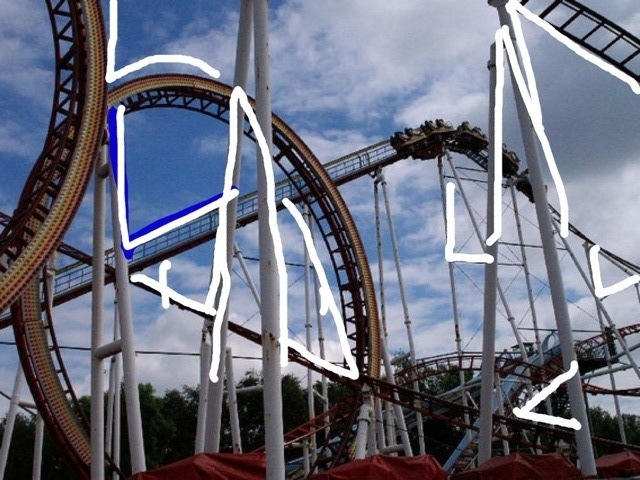 I used a photo background in doodle buddy for children to mark on the angles they could see on the structure of a roller coaster as a plenary to a lesson on using protractors and measuring angles. I took photos of the work that children produced in a science lesson on laptops when the network went down and they could save what they had done. Displaying these back on the whiteboard made a great plenary and enabled the children to see other examples of work when we would have otherwise lost their efforts. I used audio to record children’s ‘radio plays’ to retell the story of the Trojan horse. I hadn’t planned to do this, but again, because the iPad was out, I realised that this would be a much better way for the children to share their work than performing it as I knew that if they stood up in front of their peers they would begin to act ‘visually’ rather than putting their thought into the ‘audio only’ context. The main restriction with using the iPad with the whiteboard is the lack of sound output and connection. It looks like this may be possible with another cable to connect the AV. I shared the audioboos online so the children listened to them on the PCs in the classroom, but it would have been much better to listen to them as a class. The interesting point for me about the day was that having the iPad out and in use lead to several different uses of it that were inspired in the moment, when the tool suited my need at the time. All of these things I could have done with other devices, but the iPad did a pretty good job today! I haven’t blogged much since I’ve been on my second teaching placement, I just haven’t had the time or energy! A lot has happened in the intervening time. I’ve progressed as a teacher, under the expert eye of my excellent Mentor, I’ve been selected to be part of a European Mobility programme for initial teacher training and will be going to visit schools in Slovakia in April, and last week I succeeded in getting a job! I thought it was worth posting some sections from my overall reflection on this teaching placement. I was very fortunate to have an interview for a job and succeed in getting the post during my last week on my second placement. During the interview I was asked to describe my teaching style. Throughout the PGCE we have been encouraged to think about our classroom philosophy and teaching styles and express these in our professional autobiographies (and ultimately for our job application letters). Up until the interview this is a question I have always struggled with, perhaps because I had not seen many styles of teaching or been able to recognise the ethos of a school or classroom. However, being forced to describe my style under pressure I surprised myself and came up with something that is probably fairly close to how I hope I teach. I felt that I was calm and tried to foster an atmosphere where trying to think or working through a problem was more important than getting the right answer. I said I wanted to create an environment in which children felt safe to take risks and make mistakes, be independent and creative. I felt that my relationship with the children was the most important part of my teaching, that there was mutual trust and respect. One of the main realisations that I know will help me progress in my next placement is that I need to establish myself in the classroom quickly by following and applying the school discipline policy immediately. Once the children had become used to having me in the classroom they began to test my boundaries to see how I would respond. It took me three weeks before I really bit the bullet and used the sanction system in the school properly, consistently and followed through with my actions. Once I started, the children responded by meeting my expectations for behaviour and I could work much more effectively with them and concentrate on questioning, assessment and delivery during lessons. On my next placement, I will ask my Mentor what strategies they used to establish themselves with the class when they started working together in September. I think one of the problems I had was that I saw strategies my Mentor was using and copied those, not realising that she had used the full sanction system repeatedly at the beginning of the year. When we discussed this, it was clear that I needed to be much more strict as I did not have the long history of trust and boundaries that she had built with her class from the beginning of the year. On my next placement this will be even more important, as the teacher will have worked with their class for a nearly a whole year.